I love Albariño, and there’s no better place to find the good ones than the Rias Baixas region of Galicia, Spain. This winegrowing region, located across the Miño River from Portugal, produces 99% white wine, and Albariño makes up about 96% of all grape varieties planted there. So, it’s safe to say, producers here know what they’re doing with the grape. Rias Baixas wines get lots of cooling, coastal influences from the Atlantic Ocean, and the region is also known for its series of jagged inlets, like shallow fjords, called rias. (The region’s name means “lower rias.”) The region is divided into five subzones (Val do Salnés, Ribeira do Ulla, Condado de Tea, O Rosal, and Soutomaior) typified by their topography and proximity to the ocean or rivers. The soils here boast lots of granite and schist, and the rivers add in alluvial elements. All of this results in wines that are bright, vibrant, floral, salty, crisp and full of minerals. Plenty of fruit for sure, but I love the complexity of non-fruit elements in Albariño, and its lively, food-friendly appeal. It’s cold and windy on the East Coast as I write this, but crisp white wines are always welcome on my table, regardless of season. 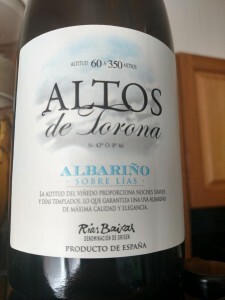 I’ve covered this region before, but I recently tasted a few Albariño wines from Rias Baixas, and found a lot of quality for the price points. I received these wines as trade samples and tasted them single-blind (except for the sole sparkling one).